Tailgating is great before football games, but in traffic, not so much. Rear-end crashes make up more than one in four of collisions reported to police each year, according to the National Highway Traffic Safety Administration – and many are preventable. 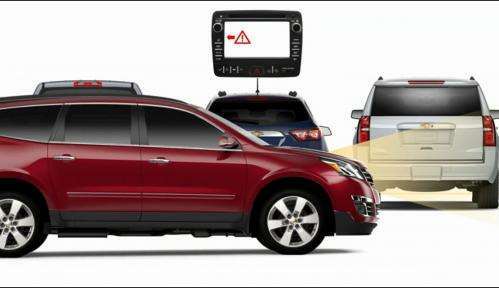 Forward Collision Alert technology available in several 2015 Chevrolet models, including the Silverado, Malibu, Equinox and Traverse, alerts customers in everyday car-following situations if they may be seconds away from a crash or following much too closely. In the 2015 Chevrolet Impala, Tahoe and Suburban, available Front Automatic Braking goes beyond an alert to automatically slow or stop the vehicle under certain conditions, for example, if the driver does not respond quickly to an alert. "Many of us have been in driving situations where the car ahead of us suddenly slows – or we momentarily look away at the wrong time – and we have to slam on the brakes to avoid a collision," said General Motors Active Safety Technical Fellow Raymond J. Kiefer. "Front Automatic Braking provides a layer of driver assistance beyond Forward Collision Alert systems to help prevent this common crash situation." Depending on the model, Chevrolet's Forward Collision Alert system uses a radar located in the front grille area or a camera mounted behind the windshield in front of the inside rearview mirror. When activated, it produces a green icon when a vehicle is detected ahead and an amber one when a driver is following much too closely. A red "Collision Alert" warning will flash – along with rapid, high-pitched beeping – when the driver is approaching a vehicle ahead too quickly and may be seconds away from a potential crash. In Chevrolet models equipped with the available Safety Alert Seat that is turned on, instead of beeps, the patented seat will quickly pulse five times on both sides. Low-speed rear crashes cost millions of dollars annually in repair costs. Higher-speed rear crashes are responsible for moderate-to-severe injuries and even fatalities. In a report earlier this year, the Insurance Institute for Highway Safety estimated that forward collision alert technology applied across the entire passenger vehicle fleet could prevent 879 fatal crashes a year. The auto industry has focused on reducing rear crashes for decades. Systems such as the Center High Mounted Stop Lamp – or CHMSL – have been in effect since 1986 in passenger cars and 1994 in light trucks. Over the long term, these have helped reduce rear crashes by about 4.3 percent annually, according to the National Highway Traffic Safety Administration. GM's Forward Collision Alert technology is designed to encourage customers to accept and use it. "Our system lets customers select either Far, Medium or Near when it comes to the timing of the alerts," said Kiefer. "Our goal is that our customers leave safety systems on every trip so they can take advantage of the potential safety benefits."